A new study claims that healthcare organizations can reduce healthcare–associated infections (HAI) by more than half, simply by upping their game on infection control practices. According to a review of 144 studies published in Infection Control & Hospital Epidemiology, the journal of the Society for Healthcare Epidemiology of America (SHEA), up to 55% of HAIs could be eliminated by systematically implementing evidence-based infection prevention and control strategies. The study further suggests that there is considerable room for improvement in infection prevention and control practices, regardless of the economic status of the country. The September release of the study was timed to coincide with Outbreak Prevention and Response Week, hosted by SHEA and key partners to raise awareness and provide resources to healthcare professionals, the infection prevention community, patients, and families on ways to prevent the spread of infectious diseases. The study is the product of researchers from University Hospital Zurich and Swissnoso, the Swiss National Center for Infection Control. They reviewed 144 studies published around the world between 2005 and 2016—including 56 conducted in the United States—to determine the proportion of HAIs prevented through infection control interventions in different economic settings. According to the study’s authors, all the papers included in the analysis studied efforts designed to prevent at least one of the five most common HAIs using a combination of two or more interventions, such as education and surveillance, or preoperative skin decolonization and preoperative changes in the skin disinfection protocol. The study’s results indicated that interventions consistently produced a 35%–55% reduction in new infections, an impressive finding considering the large number of HAIs hospitals fight every year. The largest effect was for prevention of central line–associated bloodstream infections. Primary bloodstream infections (BSI) are a common HAI that can lead to substantial patient morbidity and significantly increased healthcare costs, researchers say, leading to longer treatments and hospital stays. In fact, estimates place the treatment costs for a BSI at around $10,000–$20,000, and in ICUs the cost may be closer to $40,000. Other infections studied were catheter–associated urinary tract infections, surgical site infections, ventilator-associated pneumonia, and healthcare-associated pneumonia. What does this mean? There is no miracle cure for HAIs. According to the study authors, an accurate comparison in HAIs must be considered in the context of epidemiology changes over time. For instance, they noted that from 1997 to 2008, the percentage of the elderly over 65 years of age in the U.S. increased from 12% to 37%, and a similar increase of hospitalized patients in that age bracket was noted. Understandably, aging is associated with a higher rate of hospitalization and a predisposition to the development of chronic diseases—both of which increase the likelihood of multimorbidity, the presence of two or more chronic illnesses. The study’s findings revealed that even wealthier, more developed countries with widespread access to technology and greater advances in infection control aren’t necessarily doing a better job at combating illnesses. What does this mean for hospital rooms and how they get cleaned? Likely not much, but ensuring patient rooms receive both routine and thorough cleaning has been pinpointed as the most effective way of controlling the spread of “superbugs” in hospitals. For instance, a 2016 study by a team of researchers from the University of Virginia, Charlottesville, examined the pathways traveled by bacteria in their spread from patient to patient. The study specifically found that certain potentially deadly bacteria such as E. coli find their way outside of sinks due to splashing. In addition, when left to mature, the bacteria are able to form an infectious biofilm that can stack its way up from the inner pipework of the hospital’s plumbing all the way into the strainer of the sink. In five Cleveland-area hospitals, the study found infections in Clostridium difficile (C. diff) isolation rooms and non-isolation rooms. Researchers also cultured hands (gloved and bare, to simulate different scenarios of people picking things up off the floor) as well as other high-touch surfaces such as clothing, call buttons, medical devices, linens, and medical supplies. The researchers found that floors in patient rooms often were contaminated with bacteria such as methicillin–resistant Staphylococcus aureus (MRSA), vancomycin–resistant Enterococci (VRE), and C. diff, with the latter being the most frequently recovered pathogen in both C. diff isolation rooms and non–isolation rooms. Consider using UV. Xenex, a San Antonio, Texas–based manufacturer of robots that utilize ultraviolet (UV) light to disinfect hospital rooms, made headlines when it issued the first ever money-back guarantee to facilities if the robot they purchase (which can cost $100,000) doesn’t reduce HAIs such as C. diff within the first year of use. The machines look like wheeled carts that feature high-energy xenon or mercury light bulbs arranged in a circular fashion. The light rays can reach more surfaces far quicker than a human housekeeper, and they are generally considered to do a much better job sanitizing a room than normal housekeeping would. While the robots shouldn’t completely replace a comprehensive infection control program that includes proper housekeeping practices, some hospitals have reported 80% or greater reductions in some infections by using the technology. Orlando Health System in Florida saw a 46% reduction of HAIs such as MRSA and carbapenem–resistant Enterobacteriaceae (CRE) after using the UV robots for three years, starting in one of its 110-bed community hospitals. Other hospitals have reported reductions as well since introducing the robots into their infection control routines, including Children’s Hospital Los Angeles and Westchester Medical Center in Valhalla, New York. 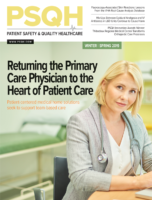 South Seminole Hospital in Miami, Florida, reported a 61% drop in C. diff, MRSA, and VRE, and saved an estimated $730,000 over a 22-month period from using the robots. Educate everyone on the dangers. 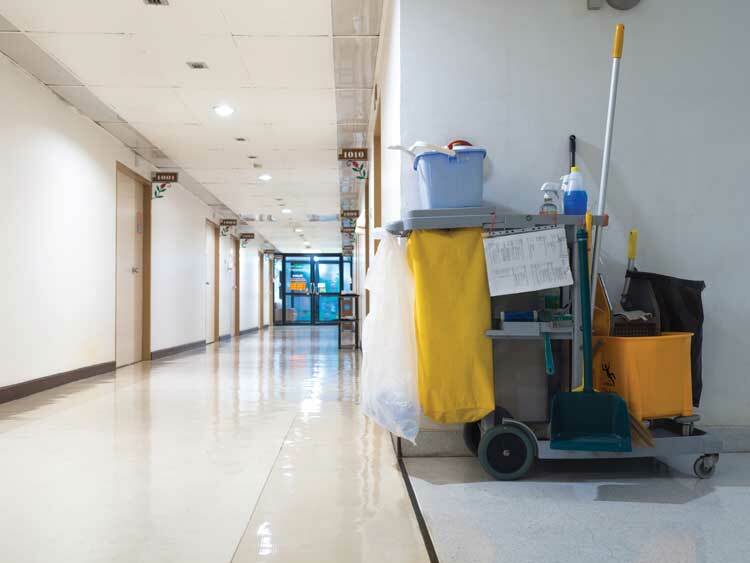 Since floors are frequently dirty and naturally contaminated, hospitals should educate staff, visitors, and healthcare workers about how important it is to avoid placing high-touch objects and equipment on the floor if possible. Conduct better floor cleaning. It’s probably a good idea to start reexamining the way your facility cleans its floors. For instance, sporicidal disinfectants used to clean rooms and kill germs such as C. diff are not typically used on floors—but perhaps they should be. Think about what else transports germs. Much like your mother probably didn’t like your shoes tracking in mud from the outside, it’s a good idea to think about how germs are being carried from place to place. Yes, they’re probably hitching a ride on things such as shoes, wheeled carts, and handbags or suitcases placed on the floor, and research conducted on pathogen dissemination backs this up. A recent study also suggests that wheelchairs could be a major source of pathogen transmission. Make handwashing compliance high-tech. Handwashing is probably the most effective way to reduce infections, but hospital employees still aren’t doing so properly. Nationwide, handwashing compliance in hospitals remains a paltry 45%. 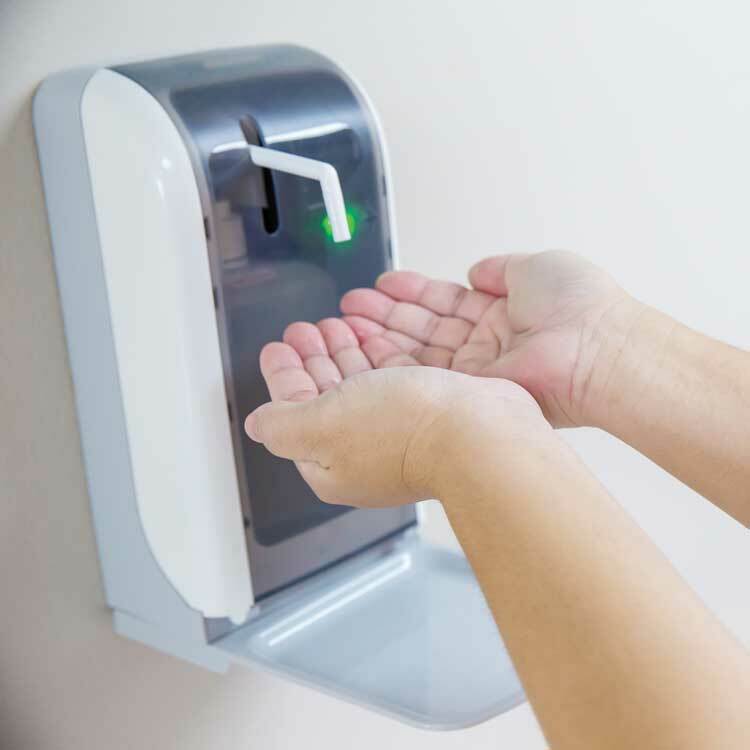 Several companies have developed systems that remind staff to wash their hands using a wearable badge; those systems then use WiFi technology to track the number of times the employee conducts handwashing. John Palmer is a freelance writer who has covered healthcare safety for numerous publications. Palmer can be reached at johnpalmer@palmereditorial.com.